The only snake from the Americas on the list, the Rattlesnake is easily identifiable by the tell tale rattle on the end of its tail. They are actually a part of the Pit Viper family, and are capable of striking at up to 2/3rd their body length. Most species of rattlesnakes have hemotoxic venom, destroying tissue, degenerating organs and causing coagulopathy (disrupted blood clotting). Some degree of permanent scarring is very likely in the event of a venomous bite, even with prompt, effective treatment, and can lead to the loss of a limb or death. 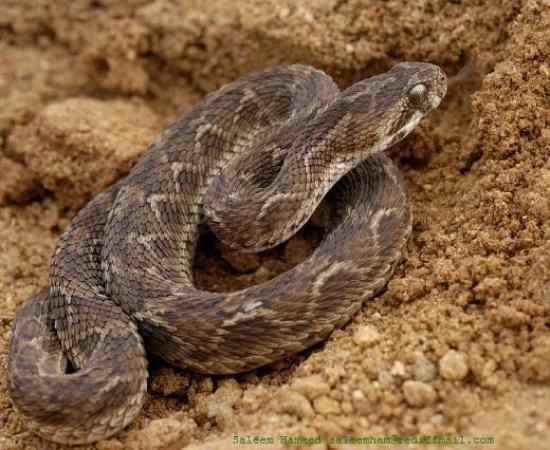 Vipers are found throughout most of the world, but arguably the most venomous is the Saw Scaled Viper and the Chain Viper, found primarily in the Middle East and Central Asia, particularly India, China and South East Asia. Vipers are quick tempered and generally nocturnal, often active after rains. They are also very fast. Most of these species have venom that cause symptoms that begin with pain at the site of the bite, immediately followed by swelling of the affected extremity. Bleeding is a common symptom, especially from the gums. There is a drop in blood pressure and the heart rate falls. Blistering occurs at the site of the bite, developing along the affected limb in severe cases. Necrosis is usually superficial and limited to the muscles near the bite, but may be severe in extreme cases. Vomiting and facial swelling occurs in about one-third of all cases. Severe pain may last for 2-4 weeks. Often, local swelling peaks within 48-72 hours, involving the affected limb. Discoloration may occur throughout the swollen area as red blood cells and plasma leak into muscle tissue. Death from septicaemia, respiratory or cardiac failure may occur 1 to 14 days post-bite, or even later. 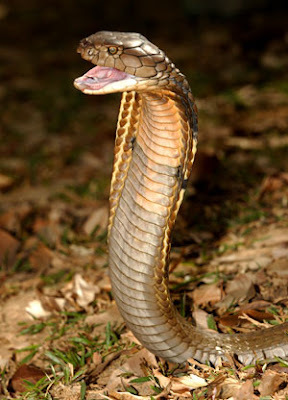 Most species of Cobra would not make this list; however the Philippine Cobra is the exception. Drop for drop, its venom is the most deadly of all the Cobra species, and they are capable of spitting it up to 3 metres. The venom is a neurotoxin which affects cardiac and respiratory function, and can cause neurotoxicity, respiratory paralysis and death in thirty minutes. The bite causes only minimal tissue damage. The neurotoxins interrupt the transmission of nerve signals by binding to the neuro-muscular junctions near the muscles. The symptoms might include headache, nausea, vomiting, abdominal pain, diarrhea, dizziness, collapse and convulsions. 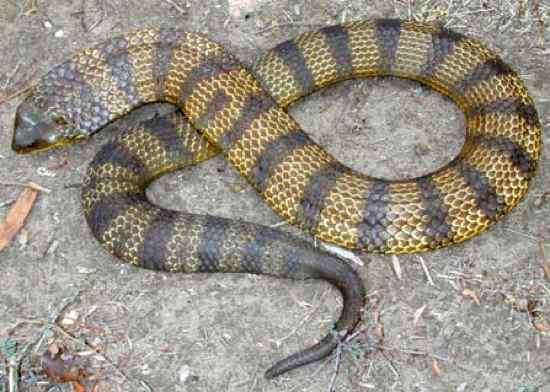 Found in Australia, the Tiger snake has a very potent neurotoxic venom. Death from a bite can occur within 30 minutes, but usually takes 6-24 hours. Prior to the development of antivenin, the fatality rate from Tiger snakes was 60-70%. Symptoms can include localized pain in the foot and neck region, tingling, numbness and sweating, followed by a fairly rapid onset of breathing difficulties and paralysis. The Tiger snake will generally flee if encountered, but can become aggressive when cornered. It strikes with unerring accuracy. The feared Black Mamba is found throughout many parts of the African continent. They are known to be highly aggressive, and strike with deadly precision. They are also the fastest land snake in the world, capable of reaching speeds of up to 20km/h. These fearsome snakes can strike up to 12 times in a row. A single bite is capable of killing anywhere from 10-25 adults. The venom is a fast acting neurotoxin. 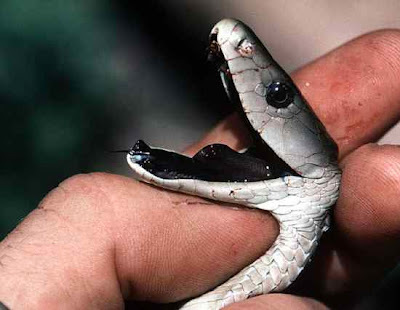 Its bite delivers about 100–120 mg of venom, on average; however, it can deliver up to 400 mg. If the venom reaches a vein, 0.25 mg/kg is sufficient to kill a human in 50% of cases. 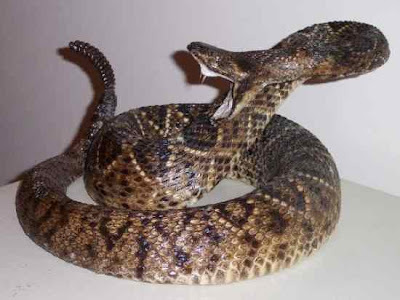 The initial symptom of the bite is local pain in the bite area, although not as severe as snakes with hemotoxins. The victim then experiences a tingling sensation in the mouth and extremities, double vision, tunnel vision, severe confusion, fever, excessive salivation (including foaming of the mouth and nose) and pronounced ataxia (lack of muscle control). If the victim does not receive medical attention, symptoms rapidly progress to severe abdominal pain, nausea and vomiting, pallor, shock, nephrotoxicity, cardio toxicity and paralysis. Eventually, the victim experiences convulsions, respiratory arrest, coma and then death. 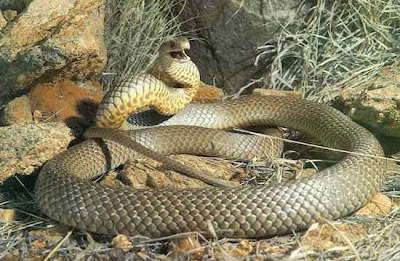 Without antivenin, the mortality rate is nearly 100%, among the highest of all venomous snakes. Depending on the nature of the bite, death can result at any time between 15 minutes and 3 hours. Another entry from Australia, the venom in a Taipan is strong enough to kill up to 12,000 guinea pigs. The venom clots the victim's blood, blocking arteries or veins. It is also highly neurotoxic. 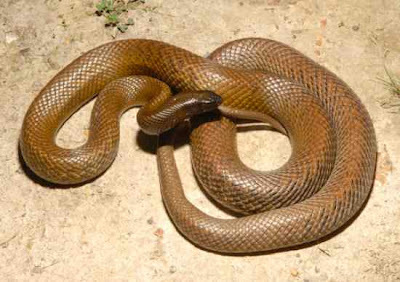 Before the advent of an antivenin, there are no known survivors of a Taipan bite, and death typically occurs within an hour. Even with successful administration of antivenin, most victims will have an extensive stay in intensive care. 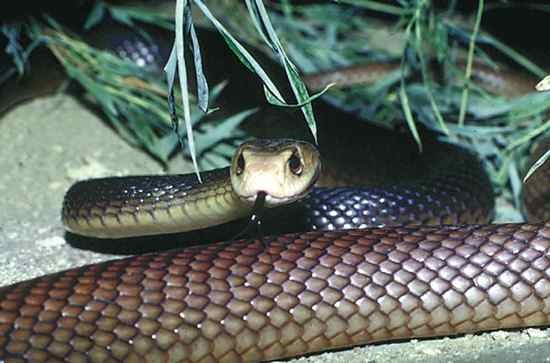 It has been likened to the African Black Mamba in morphology, ecology and behavior. The Malayan or Blue Krait is, by far, the most deadly of this species. Found throughout South East Asia and Indonesia, 50% of bites from the deadly Blue Krait are fatal, even with the administration of antivenin. 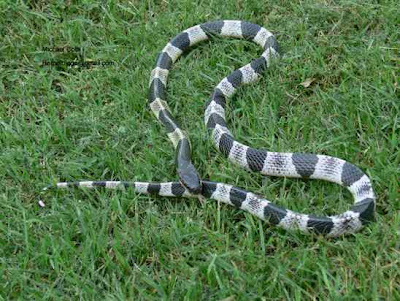 Kraits hunt and kill other snakes, even cannibalizing other Kraits. They are a nocturnal breed, and are more aggressive under the cover of darkness. However, overall they are quite timid and will often attempt to hide rather than fight. The venom is a neurotoxin, 16 times more potent than that of a Cobra. It quickly induces muscle paralysis by preventing the ability of nerve endings to properly release the chemical that sends the message to the next nerve. This is followed by a period of massive over excitation (cramps, tremors, spasms), which finally tails off to paralysis. Fortunately, bites from Kraits are rare due to their nocturnal nature. Before the development of antivenin, the fatality rate was a whopping 85%. Even if antivenin is administered in time, you are far from assured survival. Death usually occurs within 6-12 hours of a Krait bite. Even if patients make it to a hospital, permanent coma and even brain death from hypoxia may occur, given potentially long transport times to get medical care. 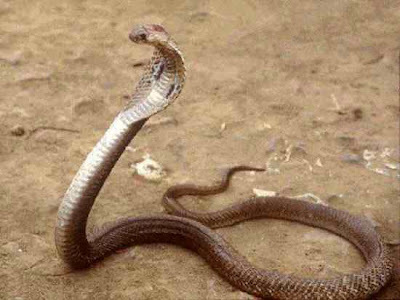 Don't let the innocuous name of this snake fool you, 1/14,000 of an ounce of its venom is enough to kill an adult human. Coming in a variety of species, the Eastern Brown snake is the most venomous. Unfortunately, its preferred habitat is also along the major population centers of Australia. The Brown snake is fast moving, can be aggressive under certain circumstances and has been known to chase aggressors and repeatedly strike at them. Even juveniles can kill a human. The venom contains both neurotoxins and blood coagulants. Fortunately for humans, less than half of bites contain venom and they prefer not to bite if at all possible. They react only to movement, so stand very still if you ever encounter one in the wild.